If your home or business is not within these highlighted territories, please call (847) 446-2500. When you choose FISH, you know that we are committed to your satisfaction! If you're like most homeowners, window cleaning is not at the top of your to-do list but your windows are filthy. We understand because window cleaning can be tedious and even dangerous. Let our friendly, professional team do the hard work for you and make your windows sparkle! We can clean all of the windows in your home - even those hard to reach ones in your foyer or outside on the third story. We wear clean shoe covers when we are inside your home and we use cloth pads under your windows as we clean to protect your flooring. We even introduce you to our team before we begin cleaning so you know exactly who will be giving your windows a spectacular shine! We maintain the appearance of your business so that you can give your customers a great impression. We clean storefronts, showrooms, restaurants, hotels, churches, and many other commercial buildings. Regardless of your budget, the size of the job, or your schedule, we can put together a customized program that fits your needs. We provide cleanings ranging from weekly to annually and we would be happy to suggest a program that would work best for you. We lead the industry with our premiere safety program that ensures the protection of our customers and our window cleaners. We are also licensed, bonded, and insured for your protection so you have nothing to worry about when you choose FISH. "I have bad bad experiences at other companies whose window cleaners never showed up when they were supposed to. 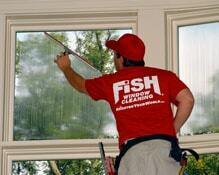 FISH [Window Cleaning] is always here on time and does a terrific job."